Orange juice is a high-value commodity, traded and consumed worldwide on a huge scale – consumption exceeds 10 Litres per person annually in many countries. 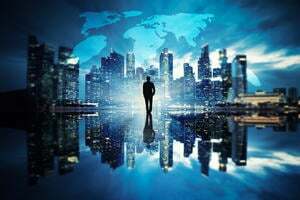 As such, it is a product that is vulnerable to fraud; there are documented instances [Kurtzweil, 1999] of dishonest companies making millions of dollars by trading in fraudulent orange juice. 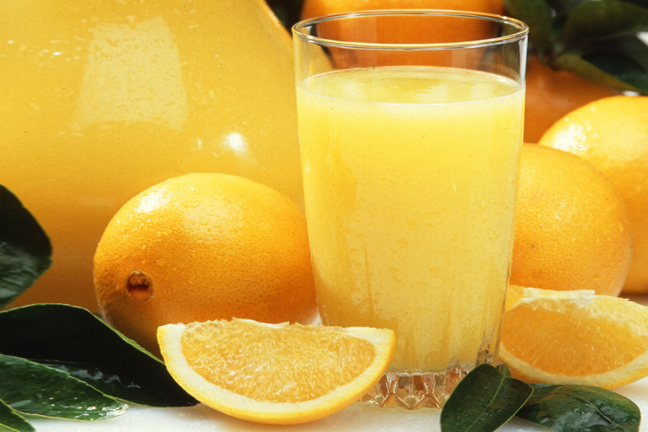 Adulteration of orange juice for economic gain generally involves extending the product by adding quantities of one or more cheaper ingredients. This could be water, sugar solution, other citrus juices - or pulp wash, an extract obtained by washing the separated pulp with water after the first pressing of the oranges. Regulations vary from country to country regarding the amount of pulp wash, if any, that can be legally added to orange juice. However, detecting and quantifying its presence is challenging, because the chemical composition of pulp wash is broadly similar to that of orange juice. High-field NMR spectroscopy provides an potential analytical solution for tackling this problem. 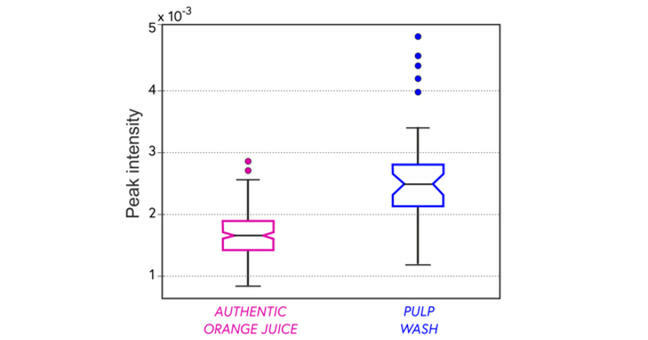 In a 2001 study [Le Gall et al], 500MHz proton NMR spectroscopy was used to analyse over 250 authentic orange juices and 50 pulp washes, from a wide range of orange cultivars and countries of origin. The sample collection included hand-squeezed juices prepared from whole fruit, as well as commercial single-strength and concentrated juices. Many of the juices were collected directly from growers; the remainder had been authenticated using accepted isotopic and chromatographic procedures. The sample set was sufficiently large to cover the range of natural variability likely to be encountered in practice. The aim of the work was to distinguish the authentic samples from the pulp washes, and to identify the critical chemical compounds involved. Eventually this approach may provide a method for detecting amounts of pulp wash present in adulterated mixtures. Sample preparation was straightforward, involving dilution with distilled water to a constant sugars concentration (11−12 °Brix), and adjusting the naturally variable pH to a constant value of 3.74 by adding microliter amounts of NaOH or HCl solutions. This adjustment is necessary because the chemical shift (position on the frequency axis) of many NMR signals is pH-dependent. Spectra were collected from all samples using a 500MHz spectrometer, equipped with a robotic autosampler which enables a high sample throughput. 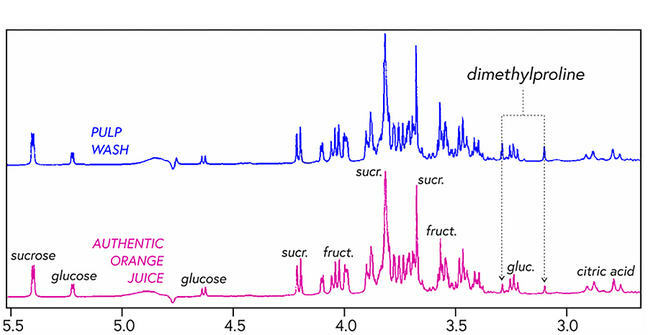 Typical spectra obtained from an orange juice and a pulp wash are shown in the figure below, focusing on the region containing the dominant signals from the main chemical components of orange juice: sugars (sucrose, glucose and fructose) and various organic acids (e.g. citric). 500 MHz1H NMR spectra of typical orange juice and pulp wash samples, showing an expanded view of the organic acid and sugars region. On first inspection, there is little obvious difference between the orange juice and pulp wash spectra. However, statistical analysis of the complete data collection identified some crucial signals that can serve as marker compounds for pulp wash. One of these is dimethylproline, with peaks as indicated on the figure. Although this compound is also present in authentic orange juice, its relative concentration is much higher in pulp wash. This finding is summarized in the boxplot below, which indicates the range of intensities of the 3.28ppm dimethylproline peak obtained from each of the two sample types, calculated from the entire data collection. Box plot summarizing the intensities of 3.28 dimethylproline peak across the entire collection of spectra. For each box, the central horizontal line indicates the median value, and the notches in the sides a confidence interval around the median. The box itself indicates the interquartile range for each group, and the “whiskers” extend to the most extreme data points not considered outliers. Outlier values are plotted individually as coloured circles. There is a statistically significant difference between the abundance of dimethylproline in each of the two groups. A number of other peaks elsewhere in the spectrum showed similar differences in abundance between the two sample types. Taken collectively, these marker compounds provide a means of distinguishing authentic orange juice from pulp wash with a success rate of ~95%. In summary, NMR spectroscopy combined with statistical analysis provides a potential tool for detecting the adulteration of orange juice with pulp wash. 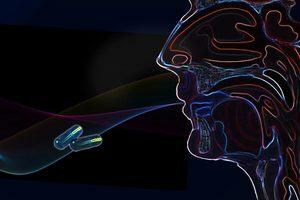 The NMR approach has particular advantages in terms of speed and diversity of information obtained. Kurtzweil, P. “Fake Food Fight”. FDA Consumer magazine, March - April 1999 View article. Le Gall G., Puaud M, Colquhoun I.J. “Discrimination between orange juice and pulp wash by 1H Nuclear Magnetic Resonance spectroscopy: identification of marker compounds”. Journal of Agricultural and Food Chemistry. 2001, 49 (2), 580-8. View abstract.